If you're familiar with this workaround, well here's a very simple way to achieve this without writing any single line of code. 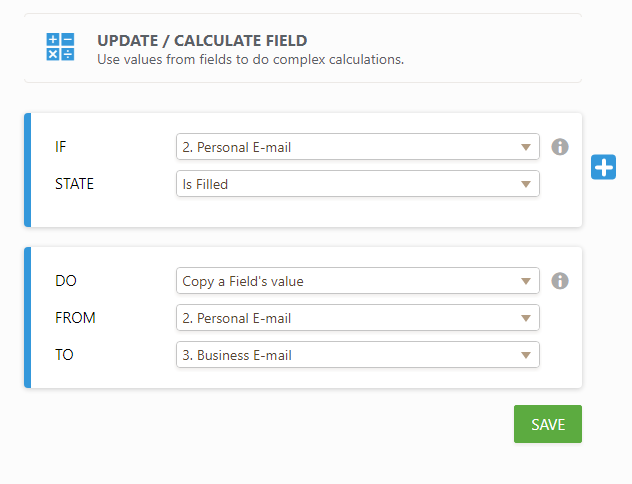 From now on, you can now populate fields like Text Box, Email, Text Area or even an Address field using the newly released feature called "Update/Calculate Field" condition. 1. 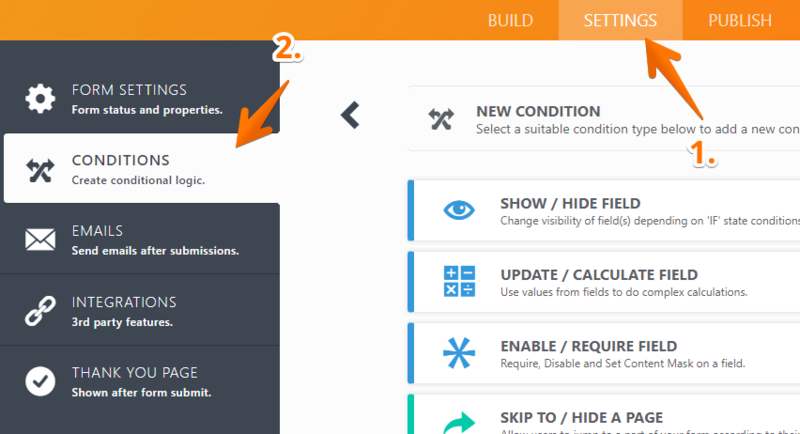 Click Settings->Conditions in the form builder. 2. In the "Conditions" wizard, select "Update/Calculate Value". 3. On the next window, do the following. a. Select a trigger point in the IF dropdown. This is usually the source field. b. Select state "Is Filled"
c. Select "Copy a Field's value" in the DO dropdown. Optional: If you want to copy multiple fields, select "Copy Multiple Field values"
4. Click Save and preview your form! Demo 1 (Email and Address Fields) http://form.jotformpro.com/form/41964168571968? 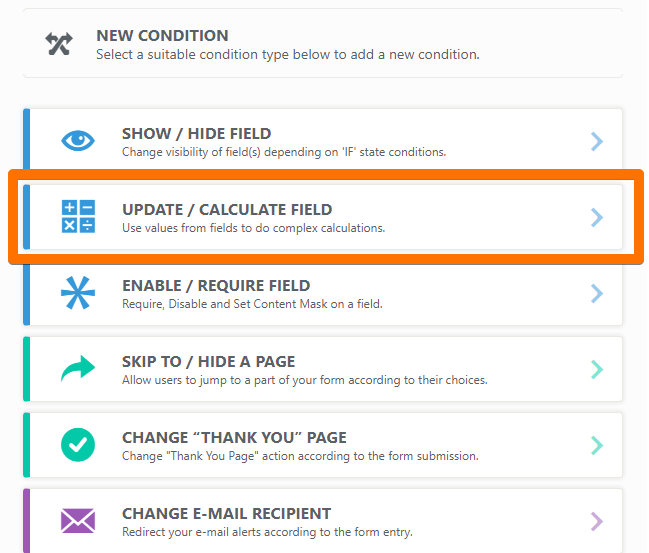 Demo 2 (Text Area Fields) http://form.jotformpro.com/form/41965390166966? If you have questions or if you need further clarification with any of the steps above, please leave a comment below. Hello, the condition keeps changing itself... I have it set to "copy a field". After I save it and reopen the condition again, it's changed itself to "calculate field"! This is severely messing my form. Please help!! hi is there a way to copy one's field value to many other fields in the form? I need to copy one chose in the first page to 60 other places, later on the user will be able to change those 60 one by one but his default will be the one he chose in the beginning. i need to copy a value from email field to a widget called (auto complete/spreedsheet to form). i followed above, but its not copying to a widget. I am nearly there with my form. The last thing i have a problem with is the drop down background is showing as black, so you can`t see the text. In build form, it is showing as white with black text which is perfect. Can you please explain how i can change this. Please show me the details for demo 2. I'm trying to pass a text field from one field to another based on the total score from the quiz. I can pass the name field, but not the text field - even if it's just one word. I have noticed that if I create a condition on the NAME element, the title (mr, mrs, miss) does not copy to another part of the form where condition defined. Anyone else have this issue? Form has service drop down menu items for types of service provided at a clinic. Based on the type an increment of time will be added to a field titled units. How can I add conditions without having to add a rule to each item?? Is it possible to pass only first 2 letters of one field to another field? I am looking to create on my form when I click on a box (is address information same as above) then the address information will be automatically populated into the following fields. I run a camp and have a lot of people who make multiple submissions of the same form where most of the input they give me is the same, just a few fields are different. (they may have 3 children they want to send to the same camp, so the children's name, dob, and blood type is different, but the parents and emergency contact's info is the same. For legal purposes, I need them to submit a separate form with all the info, but is there an easy way they could select that their info be automatically copied to the second or third submissions so they can save time? Thanks. Hi, is it possible to change the value of radio select box based on another (previous) radio select result? Many thanks. Don't worry this is now sorted. Im trying to get three fields to populate on the click of a checkbox, name and telephone work but email populates a '2' instead. Can you help guys? Hi I can't seem to copy text from one field to another. Numbers will copy but text is copying a "0" to the destination field. If I asked how many individuals attending? 1, 2 or 3? I don't want the form to ask for the 2 or 3 Names of individuals if they only chose 1, etc. this doesn't seem to be working for me. the field i'd like to have the copy shows a "0" instead of the text. i checked the box "Add field to equation as text by default". what am i doing wrong? This is exactly what I was looking for however "Insert Field as Text instead of Numeric" does not exist in mine. Instead it shows "Add field to equation as text by default." Which when select or not selected all data is evaluated as a numeric. This worked. And thank you for pointing out the field being populated being read-only. I was thinking about it so you read my mind. You guys are very responsive and a pleasure to work with. Is it possible to easily populate multiple fields from another field? For example, we ask for name in one field, and have several form tabs where we would like the name to be auto populated after it is collected on the first page. This won't work with a billing address on a credit card form? I was looking to use Math.max or an array. I was able to get the largest values with the nth function but I need to return both the values and the labels of the fields with the four largest values. Another thought I had was to create a report and email that to the individual or embed it in the form somehow. I'm not sure if advanced functions are possible in reports but I would assume so. I just haven't found it yet. Not sure why my last message was cut off. I want to be able to do line breaks in the condition. How do I acheive this? I've tried hitting return and using but neither worked when saved. Do you know if it is possible to have the roster text output to a dual list box.